I thought i would share my custom badge laser cut out of acrylic and overlayed with silver vinyl. Custom acrylic face plate for M80 in the works. Original first version M80's. Still working great save a couple dented dust covers. I thought I would give them a fresh look with a black acrylic overlay (second image). Nice totally new different look for you. I've said for years Axiom needs up update their looks a little. I like that M80. I see possibilities there. Rounded tops, white caps though, and that overlay could be different type of accent woods. Plus this would allow for a flush or recessed screen as I do not love the screens as they are now...sticking out. 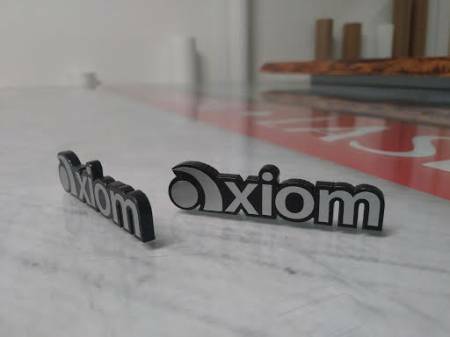 I also like the Axiom badge on top.